WOPROtab 19-16-10 (15gram) is our NPK fertilizer tablet with controlled slow release effect. WOPRO-TAB 19-16-10 (15gram) is our NPK fertilizer tablet with controlled slow release effect. It is made based on special combinations of nutrients. With Mg and trace elements this fertilizer tablet is suitable for new plantations of woody plants in forestry, agriculture and landscaping. WOPRO-TAB fertilizer tablets ensure a balanced nutrition with the most important main and trace elements of perennial crop plants, for a time period up to 3 years. The fertilizer tablet can be put directly underneath the plant during the plantation process or can be placed next to the plant, for later fertilization. Having in mind, to achieve a fostering respectively initialization of the micro biological activity in soils, the methylen carbamide chains contain an additional amount of micro biological usable, molecular distributed phosphor, which is exactly defined. This P2O5 content, which is evenly distributed in the product and which is available for the micro- organisms by a special formulation technology in soluble form, amounts to 3 %. Why use fertilizer tablets of WOPRO-TAB? The composition of the nutrients in WOPRO-TAB 19-16-10 (15g) has proven itself in the past, with good results in reforestation. The loss rate of forest plants, which were under nutritioned, has been drastically reduced. Only the young tree/seedling will be supplied with nutrients and lesser to the other vegetation in their nearest surrounding. The long term nitrogen in WOPRO-TAB 19-16-10 (15g) fosters the microbial activity of the soil and offers further plant physiological / ecological advantages as e.g. Plant the WOPRO-TAB about 15 cm sideways of the stem approx. 15 cm deep. For later fertilization place the tablet next to the stem, in the root area of the plant and press slightly into the soil. Per 50 cm height of plants resp. 1 cm stem diameter, 1 fertilizer tablet. Store in a cool and dry place. The recommendations given here are of a general nature only. Carefully consult the special instructions for use before applying the product. The fertilizer tablet will be placed approx. 10-15 cm laterally to the stem in a depth of approx. 1 cm. The information below gives you a indication of the composition of our fertilizer tablet and a more detailed background of the benefits. Action: WOPRO-TAB 19-16-10 (15g) has both, a starter and a controlled slow release effect. The surface of the tablet has been enriched with nutrients, which will have an effect almost immediately, to promote seedling development. This balanced and fully compatible supply of nutrients is essential during the critical first few weeks of the plant’s development. Special phosphor,- potassium and magnesium long-term formulations guarantee a controlled release of the nutrients with a salt content, which has been reduced to a minimum. The controlled slow release effect provides the nutrients in accordance with the plants growing requirements. The release time depends on various factors in which soil humidity, soil temperature and the soils microbial activity play a decisive role. The release time will be approx. 2-3 years under Central European soil and climate conditions, and approximately 1 to 1,5 years in warmer regions. The polymer long terms nitrogen (methylen carbamide) will be converted in the soil nearly exclusively by microorganisms to a nitrogen which is available to the plant. The soil temperature and the soil humidity primarily determine the biological conversion. This represents the direct relationship between nitrogen supply from methylen carbamide and nitrogen demand of the plant. Such a principle allows WOPRO-TAB 19-16-10 (15g) to be an environmental product which meets all ecological demands. 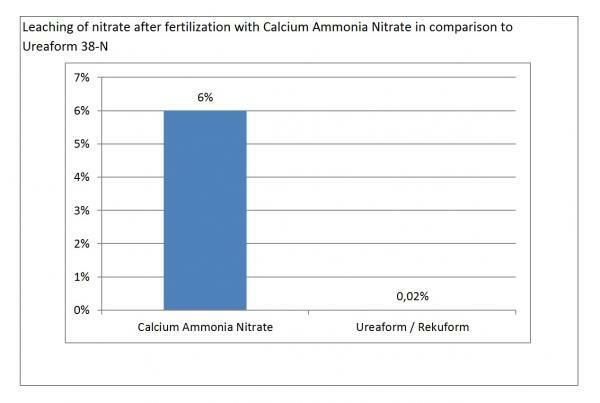 The long-term nitrogen will be decomposed evenly and constantly over a relatively broad pH area. 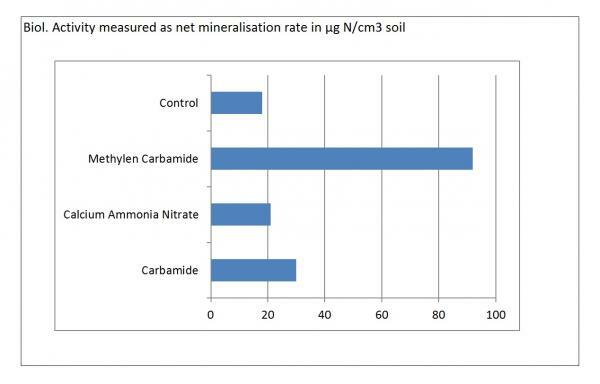 Even in soils with extreme sour pH conditions the mineralisation of the methylen carbamide chains will not be accelerated a lot. A hydrolytic decomposition under sour and extreme humid conditions does not take place.